Wuhan is the capital of Hubei prefecture in central eastern China. With a population of 10 million it is the biggest city in central China. During my brief stay, there was little that distinguished it for me from other Chinese cities except maybe the air pollution seemed even murkier than usual. I stayed for three days, most of which were taken up with work or sleep as I recovered from the long journey, via Manchester, Amsterdam and Beijing. Thankfully my luxurious super modern room at the Hotel Marco Polo (Times Square, 159 Yanjiang Avenue) was an air conditioned haven from the heat (33C at the end of August) and pollution outside. I could lie in my bath on the corner of the 15th floor and gaze out over the river and other tall buildings sitting ghostlike in the soupy air. The view should have been much better but visibility was down to just a few hundred metres at times. The hotel has a very well equipped gym and also a pool but the latter was closed for renovation when I was there so I can’t comment on it. Every staff member I met was really helpful and friendly. My only gripe was that I couldn’t access my BT Yahoo email account. I was prepared for having my WordPress blog and Facebook blocked by the Great Firewall of China but losing email as well was a new one on me. Whether Wi-Fi or cable, in the room or in the lobby, the internet was really slow and eventually I just gave up on it. Unusually though, the hotel did have both BBC and CNN on the TV, both of which are often blocked in other hotels where Westerners don’t usually stay. The hotel breakfast is pretty comprehensive, catering for both Western and Chinese tastes. A typical Hubei breakfast food that I tried here was Hot & Dry Noodles, the spice coming from the dried chillies and the dryness from the sesame paste which the noodles are tossed in. There was a diced vegetable in the mix but I couldn’t work out what it was. It was edible enough but I can’t say I was wild about it (C+). I also tried Doupi which is sometimes described as a kind of pizza. In fact it’s two large sheets of beancurd sandwiching a filling of rice and perhaps other ingredients like beef, shrimp or mushroom, although they just had the plain version at the hotel. I did eat in the rather boring hotel restaurant one night as I was too tired to go out. The food was fine (A) but expensive. I paid double what I would elsewhere for three small beers, a plate of fried rice and some steamed pak choi. 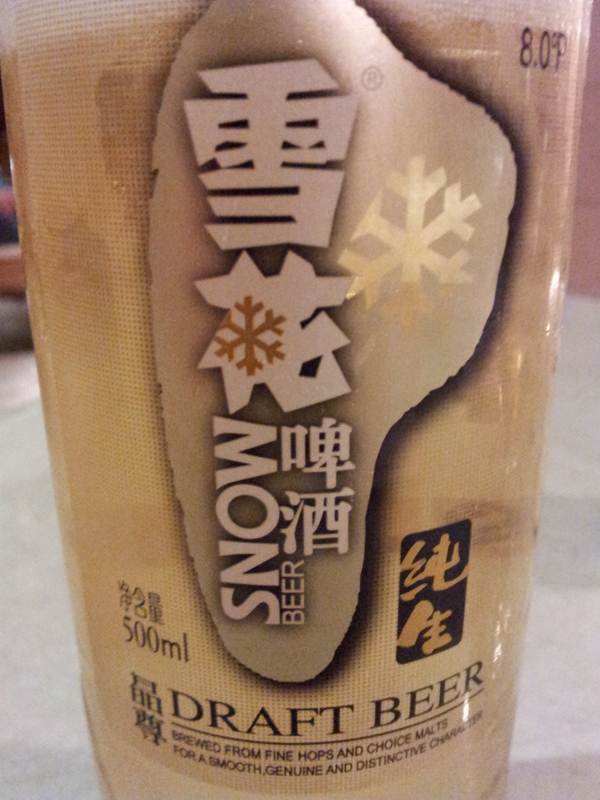 On another night I decided to get out and about, so I went to this place recommended by the Eyewitness guide for China. Yanyangtian (aka Sunny Sky), (Advanced B+), Jiefang Dadao, Baofeng Lukou, Tel 027 8375 0706. This place is a fifteen minute cab ride from the hotel but as taxis are really cheap it only costs about £2 to get there. There are two floors, a large, noisy and plainly decorated main room at ground level and a more intimate and nicely decorated smaller room upstairs. As is often the case, the staff were pretty shocked to see a Westerner but they were friendly enough. I was armed with my food flashcards (see my post on Getting Fed in China) and dictionary app so communications went fairly smoothly. 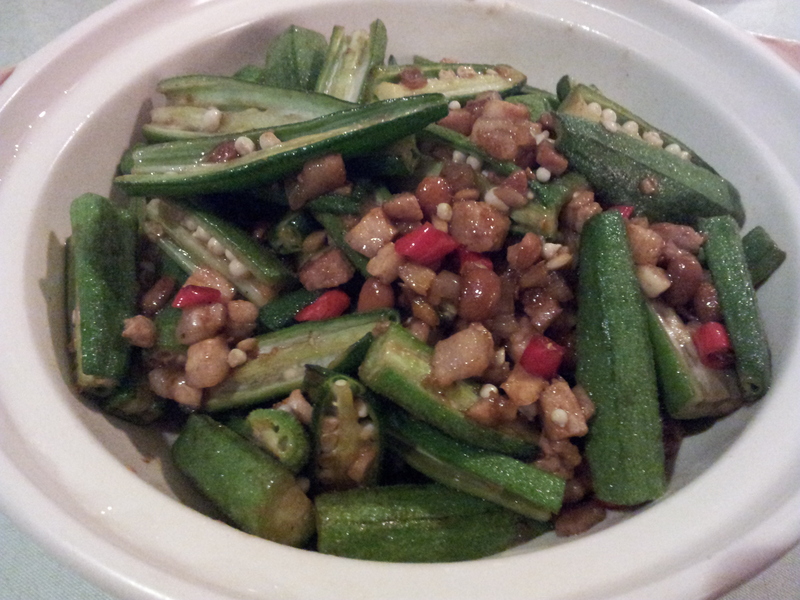 On the advice of the guide I tried Nongjia Xiaochaoru which was described as a spicy pork dish but was actually okra tossed in chillies and tiny chunks of cubed pork and some other ‘stuff’, all good (A) . Usually, alongside my main fish or meat dish, I have a plate of stir fried green leafy veg of some description so I just pointed at something green on the picture menu without knowing what it actually was. 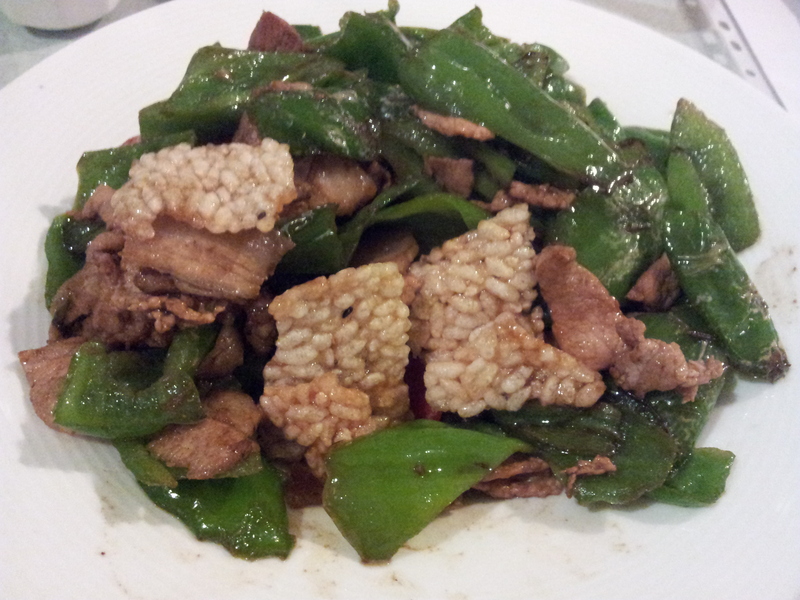 In the end it turned out to be green peppers with larger slices of fatty pork sitting on chunks of a hard rice cake, which was fine (B) but resulted in a bit of an overkill on both the veg and meat fronts! Both dishes were good but the portions were huge (meant to be shared by a group) so I couldn’t finish them. However, even with two 500ml Snow beers and a big bowl of steamed rice, the bill was much cheaper than the hotel even though this was quite a posh restaurant. The Eyewitness guide mentions a few other restaurants which I list below, even though I haven’t been to them. It’s best to have reception call them first to make sure you can get in and also write the address for the taxi driver. Take the phone number so the driver can call if he’s not sure where to go. Changchunguan Sucaigan (269 Wuchang, Tel 027 885 4229) is a vegetarian restaurant next to a Daoist temple, the decor of which it mimics. The guide suggests you try Lazi Tianluo, apparently a veggie version of river snails, or Xiaopinpan which is a sample platter of their most popular dishes. Fang Fang Caiguan (1 Jiqing Jie. Tel 027 8281 0954) is the oldest and largest restaurant in town. Apparently you can pay to be serenaded with pop hits or trad classics which for me makes it sound like a place to avoid, but others might like that kind of thing. 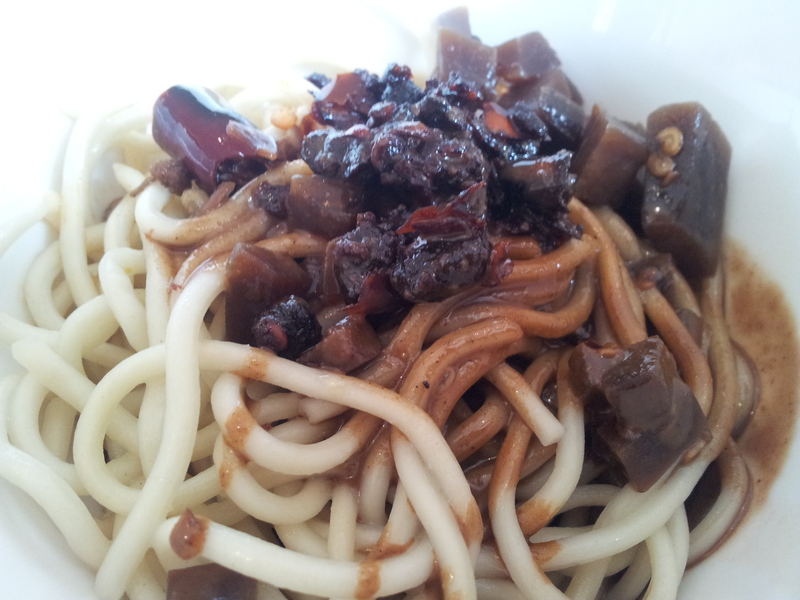 The Ya Bozi (duck’s neck) and caiyu lianou (fish and lotus root) are supposed to be good. Mr Xie Restaurant & Pub (558 Jiefang Dadao, Baofeng Lukou, Tel 027 8577 7288) is a busy expat hangout which lots of locals also go to too. 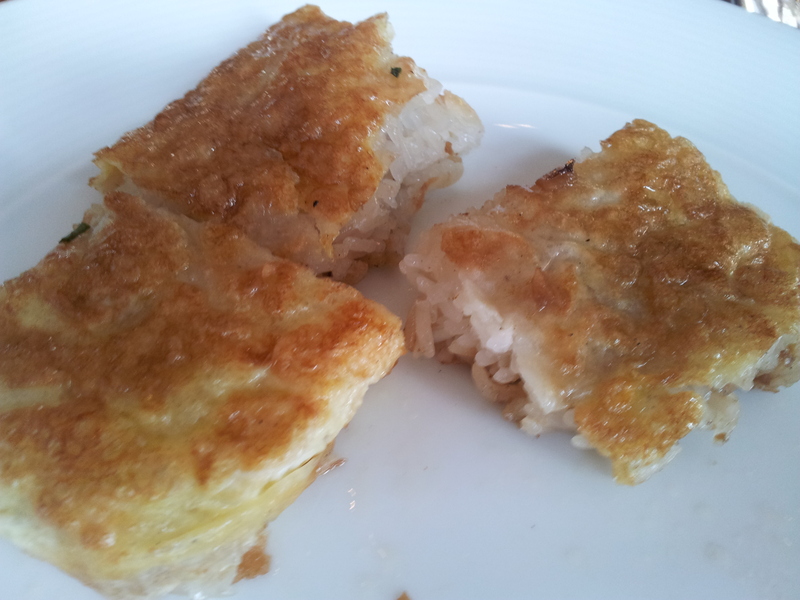 The steamed Wuchang Fish (Qingzheng Wuchang Yu) is recommended. I wanted to go to Xie’s most of all but the taxi driver told me it was shut so I went to Sunny Sky instead. I don’t know whether the closure is just temporary or permanent. Other than this I can’t say much about Wuhan. Important historical events have taken place here (various uprisings and battles) but there is not much to see as far as I can make out. There are a few old buildings with some nice architecture along Yanjiang Avenue. If you turn left out of the hotel and walk straight you will soon come to the former Bank of Indochina building on your left which looks quite nice. There are a few bars next to it that look good but I didn’t have the time or energy to check them out. Catching the train in China is much like catching a plane, complete with trolley pushing stewardesses and meals in trays that you can purchase on request. The stations in major cities are huge terminals where thousands of people sit waiting to be released onto the platforms. Rather than buy the tickets at the station (involving long queues and ticket sellers that don’t speak English) you should buy them, at least a day in advance, via the hotel concierge. Travelling first class guarantees you a seat but don’t hang about because all the seats in both classes usually sell out very quickly. It’s also a good idea to aim to arrive at the station 45 minutes early as taxis can be scarce at peak times and traffic jams can seriously delay you (see my Ningbo post for the nightmare I experienced on my last trip). The hotel told me it takes about 20 minutes to drive to the station but they didn’t say that it can take nearly as long again for the bell boys to get you a vehicle. I eventually went out on the street and got one myself after only a couple of minutes but perhaps I was lucky. Once at the station you need to factor in a bit of a walk due to the size of the building. Tickets and signs are all in Mandarin so you only have the numbers of your train, carriage and seat printed on your ticket to help you. There are usually two entrances down to either end of the platform which are numbered according to the carriages that are at the front or back of the train. Thankfully after a traffic jam scare, I made it with about 20 minutes to spare. Next stop Xiangyang. This entry was posted on February 28, 2014 at 5:56 am and is filed under China, Hubei, Wuhan with tags Hotel Marco Polo, Sunny Sky, Yanyangtian. You can follow any responses to this entry through the RSS 2.0 feed. You can leave a response, or trackback from your own site.